For example, check out the app below, which explores homicide data from 2007-2017 for 50 cities in the U.S. With just the move of a mouse, you can view various statistics related to homicides within one mile of the cursor location. All the queries are fast because they run locally on the client. Queries to the LayerView execute client-side, allowing you to create interactive data exploration apps. This blog will explore this, and other apps to demonstrate the power of client-side queries. We revamped the Query documentation at 4.8 to be more explicit about the following types of queries you can execute against a feature service or layer view. These query types aren’t exclusive of one another. Elements of each can be combined to answer more complex questions related to your data. We encourage you to explore the documentation and samples to learn more about the query capabilities we support since we can’t cover them all here. Generally speaking, the concepts mentioned above aren’t new. The JS API has supported query functionality server-side for years. What is new, is that you can now do all of that client-side, vastly improving the interactivity of your applications. 2. Developing new technologies in the JS API. Over the last few releases, we have used Web Workers to offset heavy computational processing to lightweight threads, thus preventing your application’s user interface from freezing. This allows you to accomplish heavy processing in the browser without negatively affecting the user experience. We developed a RPC framework around web workers and promises to streamline development, allowing us to implement key features such as module loading and falling back code execution to the main thread if the web application runs in a restricted environment (CSP). More recently, we have leveraged WebAssembly, which allows us to compile and run C code in the web browser with great performance taking advantage of mature and efficient code Esri already developed through the years for the ArcGIS Pro and Runtime SDKs. WebAssembly is the mechanism that allows us to run the Projection Engine client-side for converting geometries to other spatial references on the fly. The following pieces of the JS API have also played an integral role in beefing up our support for client side queries. The Geometry Engine, which evaluates the spatial relationship between two or more geometries client side, is used to evaluate queries that specify a query distance and/or a spatial relationship. We added a SQL92 parser and runtime, which uses grammar processed with PegJS, to evaluate where clauses. It was originally used for the definitionExpression property of the SceneLayer, but we now use it more broadly to process SQL client-side throughout the API. Finally, we wrapped up all these technologies in a query engine that processes the queries, projects (or converts) the geometries on demand, tests feature attributes against the SQL where clause, and evaluates outFields as expressions. While the query engine powers the query methods in the FeatureLayerView, it is also used in the CSVLayer to display your data in hundreds of projections and query CSV files transparently. In the upcoming 4.9 release of the JS API, FeatureLayers constructed with client-side features will take advantage of this as well. The following are some examples that demonstrate combinations of queries executed on the client rather than a service. 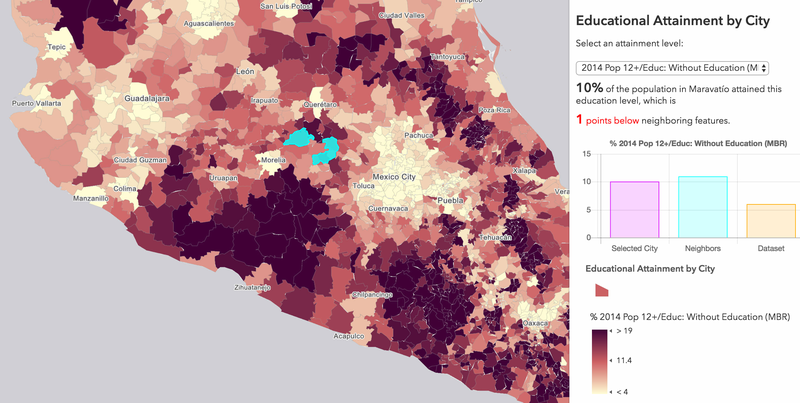 This app queries data from educational attainment fields each time the user interacts with the view. The chart displays the results of these queries for only features visible in the view. 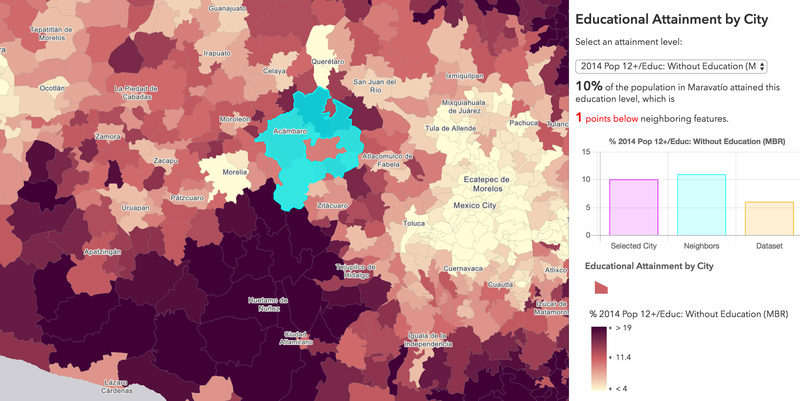 This app visualizes the predominant educational attainment level achieved in each municipality of Mexico. The chart to the right breaks down the proportion of each attained level for all features in the current view. As you pan and zoom to different regions, you’ll see the chart update to reflect the statistics of features within the new extent. This is accomplished by querying for the sum of each educational attainment field and setting the query geometry to the view’s extent. // e.g. "EDUC01_CY", "EDUC02_CY", "EDUC03_CY"
The following application displays various statistics about homicides within a one mile radius of the cursor’s location. In all, about 30 statistics are queried with each mouse move, allowing the user to dynamically interact with the data in ways that otherwise wouldn’t be possible if those queries had to be requested from a server. There are four relevant fields of interest in this dataset: disposition, victim_sex, victim_age, victim_race. Since some of these fields contain string values, we can write a set of SQL expressions to return a count for each unique type. The following snippet demonstrates how the query looks for getting the count of each value of the disposition field. Notice the query geometry references the location of the pointer buffered to one mile. Again, this query executes on every pointer-move event, something that isn’t feasible for server-side queries. Spatial queries are only as good as the precision of the data. Since the LayerView generalizes geometries for optimized performance in a browser, each spatial relationship, such as touches, may yield unexpected results. Smaller features may also be completely dropped from the client, since they can’t be appropriately visualized anyway, thus yielding incomplete query results for certain cases. In the app below, for example, as the user moves the cursor over a municipality, a spatial query is executed for all features that touch the feature intersecting the pointer. The value of a variable from the selected feature is then compared to the average value of the same variable from the neighboring, or touching, features. As you zoom away from the data, the polygons become more generalized, causing the touches query to return imprecise results even though the full resolution geometries from the service follow strict topological rules. As you zoom closer to the data, the geometries are loaded at a higher resolution, allowing the queries to return expected results. As you zoom to smaller scales, geometries become more generalized, so some spatial relationships like "touches" will yield results that appear incorrect. However, as you zoom to larger scales, the geometry will have a higher resolution, so spatial relationships are more accurately maintained, yielding more precise results. To keep the user from seeing imprecise results, you can set a scale constraint on the view to prohibit them from zooming out to scales where low resolutions are inevitable, or you can compromise and alter the query in the following manner. // use "intersects" instead of "touches"
This query is for intersecting features that don’t match the input geometry, yielding better results at smaller scales. If precision is more important than fast performance, then you need to query the service for the full resolution geometries. LayerView queries can be a powerful way to add interactivity to your application. However, they come at the expense of precision. So if geometry precision matters more than fast interactivity in your app, then stick with executing server-based queries against the feature service. However, if interactivity wins, then give LayerView queries a shot. Your users will find your apps more engaging and may be prompted to ask additional questions resulting in them gaining more insight into the data.